With their four sons grown, the Rindts were ready to focus on retirement and downsize their home. When they chose a new home, however, they knew it required a few updates. Especially the master bathroom. From the dated tile to the whirlpool bath, the bathroom space wasn’t aesthetically pleasing and wasn’t practical for a couple well into their 60s. So the Rindts began to talk about what a bathroom that was safe, accessible and beautiful bathroom might look like. After discovering both the toilet and shower were broken, they decided to make the remodel a reality. As self-described “shower people,” the Rindts focused first on the bathing space. 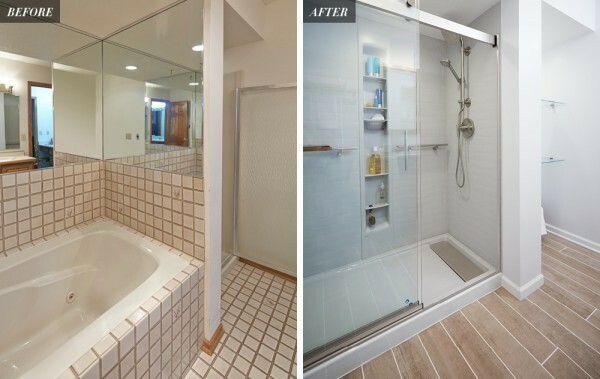 They knew they could go without a bath in their master bathroom, and they realized removing it would free up a lot of space. Because the existing shower was so small, the Rindts wondered if they could fit a new shower where the unused whirlpool currently sat—and what they could do with the existing shower space. With a history of knee issues, Mrs. Rindt wanted to be sure the showering space was safe as well as functional. And because they were replacing an old whirlpool, the Rindts needed a shower solution that would fit a unique footprint. Not entirely sure of the possibilities, they consulted their designer on products and accessories. Together, they landed on the Choreograph® collection, a complete showering system created with an eye toward organization and easy design coordination. Focusing on safety, the Rindts installed a non-slip surface shower base to help prevent falls. Continuing with their eyes on their future, they added strategically placed shower barres in the shower, which they could use for support while entering and exiting. And while they knew they wouldn’t use it yet, they purchased a stylish and coordinating shower seat from the collection for future use. Choreograph® shower walls with built-in, customizable storage kept everything organized. And because the walls connect via a joint system, the seams are easier to clean and maintain over time—an important consideration for maintenance heading into the Rindts’ golden years. They added a handshower for the ability to spray every inch of the shower for a thorough cleaning. Of course, the Rindts realized using the showering space wasn’t the only bathroom challenge they might face as they aged. Balance and mobility were factors in considering a toilet upgrade. They decided on a toilet seat that sits at the same height as a chair to make sitting and standing easier. Thinking again about ease of cleaning, they chose a one-piece toilet, which eliminates the space between the otherwise separate tank and bowl. The toilet features what’s known as a “skirted” base, which means the sides are smooth instead of having a curvy, exposed trapway. This means less crawling around and reaching into crannies while cleaning. With decisions about functionality made, the Rindts and their designer began to focus on how to make the space both eye-catching and calming. They sought an open design with muted colors that would achieve a clean, modern look. They also answered one of their biggest questions in a unique way. With the old shower removed, they decided to extend the open look by adding glass shelves that hold extra towels and some very simple decorative items. With the final touches in place, the Rindts were pleased. 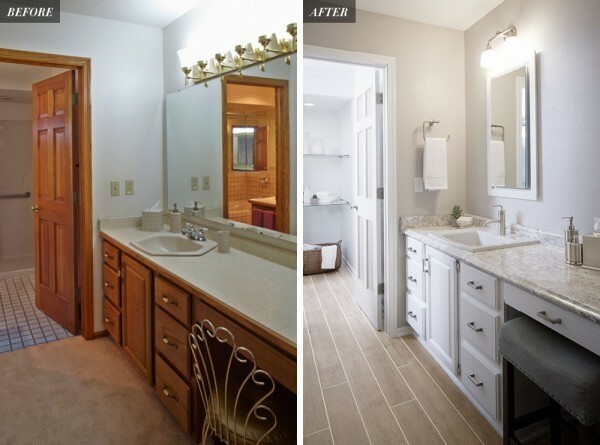 The new master bath was both functional for the future and beautiful for today. If you’re thinking about a bathroom remodel, take a tip from the Rindts and consider how you’ll use the space in the future. If you plan to retire in your home—or if you’re younger and plan to grow your family— making the right decisions today can make your bathroom one you’ll find functional for years to come. For example, a Walk-In Bath can provide a more comfortable and secure bathing experience for those who need a more accessible alternative to a shower. Thinking about updating the design and functionality of your bathroom? Whether you want to revitalize your outdated space or switch to a completely new look, our Bathroom Design Service can help you. It’s quick, affordable and allows you to work with a Kohler Designer to make your dream bathroom a reality through online personalized meetings.